Lo mein should not be a lengthy process (if Chinese Restaurants can have it ready in a fastly manner then the process should be fairly quick.) This Lo mein recipe doesn’t require a dozen of different condiments and the process from start to finish is probably less than 20 minutes! Make it Chicken Lo mein but vegetables that you may already have on hand can be all that you really need. Bamboo shoots or bean sprouts are not mandatory to make lo mein, using the ends of a romaine head (or any salad greens, chopped up with white parts), or even a stalk of celery can all make substitutes for the crunchy veggies. The sauce ingredients are simple and the only Asian condiments needed is soy sauce and oyster sauce. Oyster sauce can be found at Walmart but if for any reason you want to use something else I found that a stir-fry sauce has oyster extracts in it, so perhaps that can be a substitute for the oyster sauce. Making Lo mein is simple with some cooking, frying and tossing you have a take-out copycat made from home. This is a must try recipe if you like Lo mein! 1. Cook noodles to package instructions. Drain; rinse and toss with 1 TBSP oil to prevent sticking. Set aside. 2. Heat a large skillet or wok over high heat. Add 1 TBSP of oil and veggies. Stir until vegetables are nicely seared (about 3 minutes.) Add in the noodles and pour in the sauce. Toss everything together over high heat until well combined. Serve. NOTE: Add 1 tsp of sesame oil with the veggies for an aromatic flavor. Use peanut oil or canola oil for the stir-fry. Lo mein noodles tend to run slightly bigger then chow mein noodles. 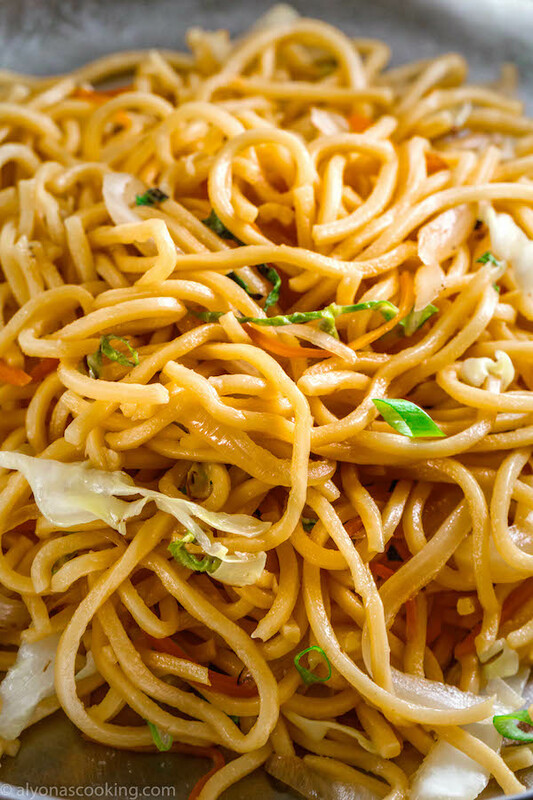 Both lo mein and chow mein noodles are made from wheat flour and since lo mein is made from eggs it is notable for it’s elastic texture. Chow mein, on the other hand, can be steamed or bought crispy. Where to buy Lo Mein noodles? I buy Lo mein noodles in the freezer section of Restaurant Depo but here is the exact brand of the lo mein noodles that I use. Twin Marquis lo mein can be kept frozen until needed and takes minutes to cook. I highly recommend this brand! Lo mein should not be a lengthy process (if Chinese Restaurants can have it ready in a fastly manner then the process should be fairly quick.) 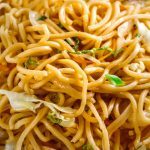 This Lo mein recipe doesn't require a dozen of different condiments and the process from start to finish is probably less than 20 minutes! Make it Chicken Lo mein but vegetables that you may already have on hand can be all that you really need. Cook noodles to package instructions. Drain; rinse and toss with 1 TBSP oil to prevent sticking. Set aside. Heat a large skillet or wok over high heat. Add 1 TBSP of oil and veggies. Stir until vegetables are nicely seared (about 3 minutes.) Add in the noodles and pour in the sauce. Toss everything together over high heat until well combined. Serve. Let us know when you make this recipe!Leave a comment, rate it, and tag #alyonascooking! I tried this over the weekend, soo good! Thank you, Anna! I’m glad to hear that!